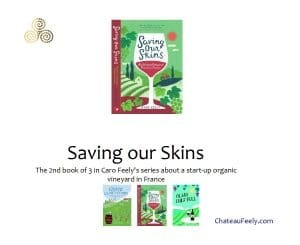 See the Saving our Skins Slideshow PDF for a quick introduction to Caro Feely’s second book in the Feely vineyard Trilogy and its story or scroll down for more. Buy the book online at amazon.co.uk or at amazon.com. In the book you’ll discover the organic vineyard where the story takes place and an intense story while learning about wine, organic farming, biodynamics and natural wine along the way. 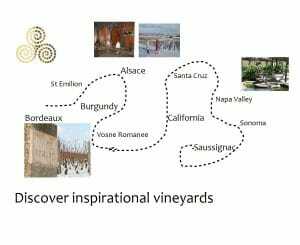 You will also discover vineyards in the surrounding areas like St Emilion and exciting vineyards in Alsace including Zind Humbrecht, Domaine Deiss and Klur, in Burgundy including Anne Gros and the incredible grand crus like La Tâche, Richebourg, Echezéux and Romanee Conti in Vosne Romanee, in California like Cakebread in Napa Valley, Benziger, Inman family vineyards and DeLoach in Sonoma, Santa Cruz and the new Fetzer family estate Ceago. Read Caro’s books Grape Expectations , Saving our Skins and latest book Glass Half Full. 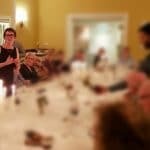 If you are interested in organic farming and/ or wine you can learn more at Chateau Feely’s Wine school – our next WSET level 2 course . See our series on why organic starting with these basics in more detail , read our series starting with part 1 of the why organic series. 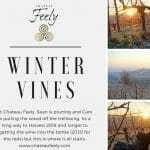 Come and discover organic farming with a visit to Chateau Feely in South West France ; stay with us or do a multi day course or multi day tour or . Join our mailing list at the bottom right of the homepage to stay up to date with our news.